Objective: In this work, niobium carbide (NbC) coatings were deposited on substrates of the tool steels AISI H13 and AISI D2 using thermo-reactive deposition/diffusion (TRD) in order to analyze their behavior against corrosion in a saline environment. Materials and methods: The niobium carbides were obtained using salt baths composed of borax pentahydrate, aluminum and ferroniobium. This mixture was heated at 1050 °C for 4 hours. The chemical composition was determined by X-ray fluorescence (XRF). The coatings were morphologically characterized using scanning electron microscopy (SEM), the crystal structure was analyzed using X-ray diffraction (XRD), and the electrochemical behavior was studied using potentiodynamic polarization curves and electrochemical impedance spectroscopy (EIS). Results and discussion: The XRF analysis indicated that the coatings contained 87.476 wt% Nb and 51.943 wt% Nb for the D2-substrate and the H13-substrate, respectively. The SEM images revealed that the morphology of the surface of the coatings was homogeneous. The XRD analysis established that the coatings were polycrystalline, and the electrochemical tests established that the corrosion resistance increased slightly in the covered substrates with respect to the uncoated steels, with the best results being obtained in the layers of niobium carbide deposited on AISI D2 steel. 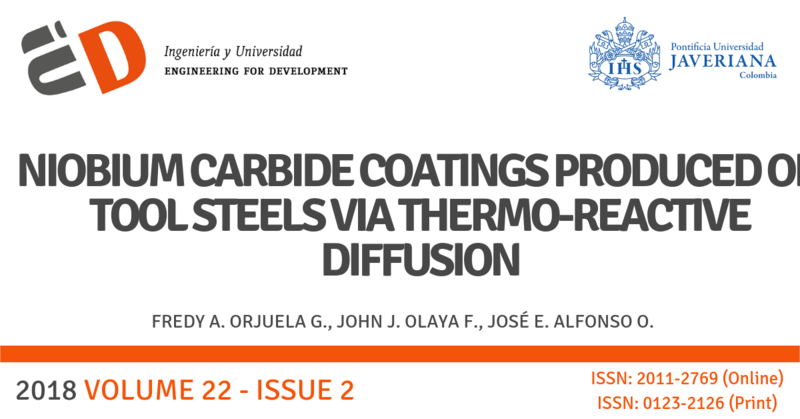 Conclusions: The analysis of corrosion resistance revealed that the coatings prepared on D2 steel have a higher corrosion resistance because they have fewer surface imperfections, which causes the coating to exhibit a dielectric behavior. T. Arai, and N. Komatsu, “Carbide Coating Process by Use of Salt Bath and its Application to Metal Forming Dies”, in Proceedings of the 18th International Machine Tool Design and Research Conference, 14-16 Sept 1977, pp. 225-231. T. Arai, H. Fujita, Y. Sugimoto, et al. “Vanadium Carbonitride Coating by Immersing into Low Temperature Salt Bath”, in Heat Treatment and Surface Engineering, George Krauss, Ed., ASM International, 1988, pp. 49-53. ISSN: 1749-5148. C. K.N. Oliveira, C. L. Benassi, and L.C. Casteletti, (2006, Oct.) “Evaluation of hard coatings obtained on AISI D2 steel by thermo-reactive deposition treatment”. Surface & Coatings Technology 201 pp. 1880–1885. ISSN: 0257-8972. http://www.sinab.unal.edu.co:2053/science/article/pii/S0257897206002787. M. G. Gee, A. Gant, I. Hutchings, et al. (2003, Aug.) “Progress towards standardization of ball cratering”. Wear 255. ISSN: 0043-1648. http://www.sinab.unal.edu.co:2053/science/article/pii/S0043164803000917. S. Sen. and U. Sen, (2008, Feb.) “Sliding wear behavior of niobium carbide coated AISI 1040 steel”. Wear 264. pp. 219–225. ISSN: 0043-1648. http://www.sinab.unal.edu.co:2053/science/article/pii/S0043164807004887. X.S. Fan, Z. G. Yang, C. Zhang, et al. (2012, Sept.) “Thermo-reactive deposition processed vanadium carbide coating: growth kinetics model and diffusion mechanism”. Surface & Coatings Technology 208. 80–86. ISSN: 0257-8972. http://www.sinab.unal.edu.co:2053/science/article/pii/S0257897212007852. X.S. Fan, Z. G. Yang, C. Zhang, et al. (2010, Oct.). “Evaluation of vanadium carbide coatings on AISI H13 obtained by thermo-reactive deposition/diffusion technique”. Surface & Coatings Technology 205. pp. 641–646. ISSN: 0257-8972. http://www.sinab.unal.edu.co:2053/science/article/pii/S0257897210005876. S. T. Oyama, “The chemistry of transition metal carbides and nitrides”, Blackie Academic & Professional, 1996. ISBN 0-7514-0365-2. http://www.books.google.com›... › Chemistry › General. F. Castillejo, (2012, Jun.) “Recubrimientos de VC y NbC producidos por TRD: tecnología económica, eficiente y ambientalmente limpia”. Ciencia e ingeniería neogranadina, vol 22-1, pp. 95-105, Bogotá, ISSN 0124-8170. http://www.umng.edu.co/documents/10162/1073246/Articulo_6.pdf. J. Mendoza, R. Durán, and J. Genescá, “Espectroscopia de impedancia electroquímica en corrosión, en Técnicas electroquímicas para el estudio de la corrosión”, Juan Genescá Llongueras, Editor. 2008: Querétaro, México. ISBN UNAM 970-32-0540-2. http://depa.fquim.unam.mx/labcorr/libro/Manual-EIS-IMP-UNAM.PDF. This journal is registered under a Creative Commons Attribution 4.0 International Public License. Thus, this work may be reproduced, distributed, and publicly shared in digital format, as long as the names of the authors and Pontificia Universidad Javeriana are acknowledged. Others are allowed to quote, adapt, transform, auto-archive, republish, and create based on this material, for any purpose (even commercial ones), provided the authorship is duly acknowledged, a link to the original work is provided, and it is specified if changes have been made. Pontificia Universidad Javeriana does not hold the rights of published works and the authors are solely responsible for the contents of their works; they keep the moral, intellectual, privacy, and publicity rights. Approving the intervention of the work (review, copy-editing, translation, layout) and the following outreach, are granted through an use license and not through an assignment of rights. This means the journal and Pontificia Universidad Javeriana cannot be held responsible for any ethical malpractice by the authors. As a consequence of the protection granted by the use license, the journal is not required to publish recantations or modify information already published, unless the errata stems from the editorial management process. Publishing contents in this journal does not generate royalties for contributors.